On Feb. 8, Emeke released the short film “Ackee & Saltfish,” which follows two best friends as they wander around East London in search of the titular meal, a Caribbean salt cod dish. 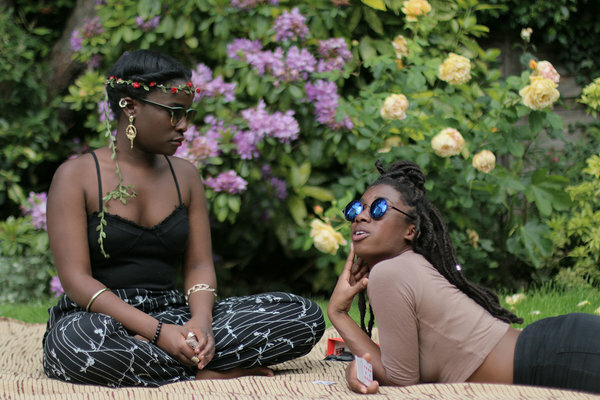 The film has been described around the web as Robert Altman-esque and as a sort of British “Broad City”; Emeke is now expanding it into a web series, which will make its debut online on Sunday. I talked with her via email about her growing body of work and the challenges of what it means to be a young filmmaker operating outside the traditional scaffolding of Hollywood. What was your inspiration for “Ackee & Saltfish”? Did you draw from your own experiences growing up? Was this based on the lives of people you knew? As for the actual story line, there were definitely a couple of specific experiences that really inspired me to write this film. The last straw was when my partner and I stumbled across an all-white, English-staffed Caribbean restaurant serving culturally appropriated versions of traditional dishes that were more expensive than the real things. To add insult to injury, Bob Marley’s face was plastered all over the walls, and the bar was designed to mimic a hut on sandy beach. Of course we ended up leaving. You also have “Flâner” and ‘Strolling,” documentaries where you walk and talk with people, usually women, about things like identity, sisterhood and pop culture. Where did that come from? There are a lot of reasons I decided to make “Strolling,” but ultimately I wanted to create a safe space for the global black diaspora to talk about issues important to us. The documentary series is very much centered on blackness, but it’s not limited to society’s idea of what that encompasses. It was also very therapeutic for me to create these short films, in which I could see parts of myself reflected in people whom I had never seen before, and judging by the response to the series so far, [others can see themselves too]. I think it’s helped a lot of people, myself included, feel less alienated and invisible.I’ve noticed that you crowdfund all your projects. I currently do crowdfund all my projects. This is partly because of the many closed doors and partly because I’m not willing to compromise my vision for money. I do hope to receive support and funding from investors and more formal institutions, because I know the value of my work. However, I am very aware of the layers of bureaucracy and discrimination that one has to trench through to get to that place, so I’m not reliant on that support. What I love about your work is the desire and determination to showcase black women — black people, really — and the breadth of lifestyles that exist. Too often, we are confined to a very limited portrayal of the black experience as a single, uniform thing. Why do you think that’s missing from mainstream media? Mainstream media is a business, and it’s often a tool of propaganda. Mainstream media does not operate on meritocracy. Around the time of ABC’s premiere of “black-ish,” I interviewed a film professor about diversity on television, and she said something that has lingered in the back of my mind since then. She said black may be trendy right now, but the true test will be whether studios and TV executives continue to seek out black stories and narratives and bring them to life, even when they aren’t so stylish or as well-watched and well-received. Do you think that’s a fair assessment? I think that’s a fair assessment. But I’m honestly not too worried about whether that happens or not. I’m interested in being imaginative in terms of creation and distribution via less conventional means. I don’t want to rely on trying to keep gatekeepers and studios interested and happy. It feels like subtle begging. I don’t feel like I should have to beg to be let in where others get a free pass. So I’m interested in creating my own means of distributing film. I don’t want to create a black ABC or a black Netflix or a black version of anything that already exists. I want to create something completely new. On American television, at least, it feels like the black experience is relegated to two categories: completely unacknowledged or totally fetishized to the point of caricature. Do you think the same is true in Europe? I think the same is true in the United Kingdom. From what I’m learning and being taught by black people throughout other parts of Europe, it does seem to be similar, if not worse there than it is in the U.K. But speaking for the U.K., it’s very interesting, because there were shows that starred complex characters in the late 1980s and early ’90s, like “The Real McCoy” and “Desmond’s” on prime-time BBC and Channel 4, but those have disappeared now. What impact do you hope your projects will have? It’s great when my work resonates with other people and we get to connect in that way. But if I were to start trying to create in order to have a certain type of impact on people, I feel that my work would become really inauthentic and become more of a product as opposed to art. More than anything, I hope to stay authentic to myself. Whether it’s five or five million people who really vibe with my work, I’m happy as long as I created what I wanted to see.